First, notice that no one accepts sincerity alone in any other area of life besides religion. Why? Because sincerity may be necessary, but it is not sufficient. 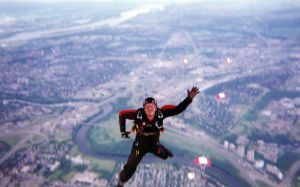 For example, if you decide to go skydiving, are you more concerned about having sincere beliefs or true beliefs? When you are coasting in a plane at 10,000 feet in the air, preparing to jump into the wild blue yonder and then plummet towards the earth at mind-numbing speeds, do you merely want a sincere belief there is actually a working parachute in your backpack? Of course not. You want a true belief that your parachute is in full working order. If you sincerely believe that your parachute works but you are sincerely wrong, you’ll look quite different once you land. Read the rest of the article at STR Place. Suppose you’re sincerely driving adhering to all rules of traffic. Like Satan is, a disobedient driver can be responsible for your being in a deadly accident (with them).